VEOS is a PC-based simulation platform for validating the software of electronic control units (ECUs) in early development process stages. A wide range of models - function models, virtual ECUs, bus systems, and plant models - can be simulated with VEOS independently of any specific simulation hardware. The new version of the platform for PC-based simulation lets you perform automotive Ethernet simulation in addition to CAN, CAN FD, and LIN simulation. For driving millions of kilometers on your PC, you can set up as many VEOS instances in one cluster as needed for the parallel execution of virtual test drives. The dSPACE Bus Manager is now available as a stand-alone version that lets you configure restbus simulation for PC-based simulation with VEOS. This dSPACE webinar shows you how to benefit from the features of the Functional Mock-up Interface (FMI) with the dSPACE tool chain. The higher the number of people involved in the development of ECU software, the more important it is to test the individual components early and realistically. BMW has chosen dSPACE VEOS as their central, PC-based simulation platform. The Ford Motor Company needed a tool chain that on the one hand accelerates the development process to meet customers’ expectations and on the other hand reduces the time and effort required by new adopters to familiarize with its methods. With the dSPACE virtual validation tool chain, they found both. As customer expectations rise and Euro NCAP requirements get tougher, the cost of developing advanced driver assistance systems threatens to become unmanageable. dSPACE offers the solution: a well-coordinated tool chain for function development, virtual validation and hardware-in-the loop simulation. 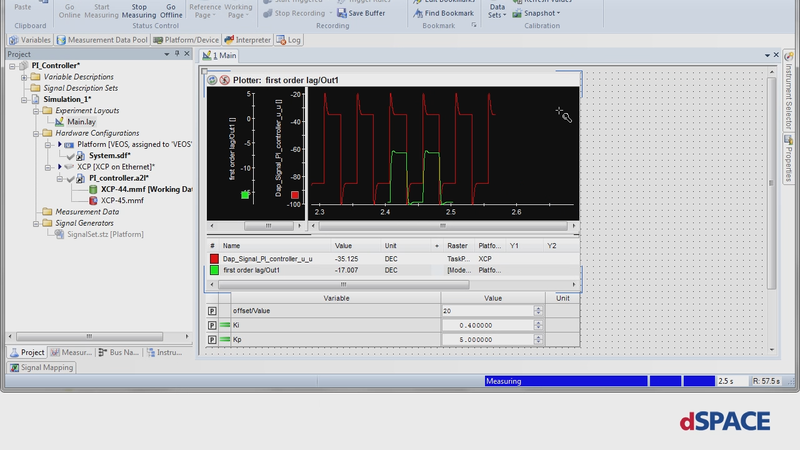 Using SystemDesk and TargetLink to generate virtual ECUs based on AUTOSAR or without. Product demonstration of using TargetLink and VEOS for a function development workflow with virtual ECUs. Product demonstration of using ControlDesk for instrumentation and simulation control in simulation scenarios with virtual ECUs. dSPACE VEOS is a PC-based simulation platform that promotes virtual validation for the development of electronic control units (ECUs). VEOS makes it possible to simulate a wide range of different models, such as function models, Functional Mock-up Units (FMUs), virtual ECUs (V-ECUs), and vehicle models, in the early development stages independent of any specific simulation hardware. For multi-model scenarios VEOS supports importing, connecting, and running any number of function and plant models based on Simulink or Functional Mock-up Interface (FMI), thereby extending the scope of the applications. VEOS runs on standard PCs, which gives function developers, software architects, and ECU testers a variety of new options for virtual validation during the early project phases. Software-software integration can be tested from component to system level. Sophisticated environment models can be integrated with virtual ECUs to validate complex controller strategies or simulate and test entire virtual vehicles. In preparation for hardware-in-the-loop simulation, models and tests can be created, set up, and run on a PC, independent of the hardware-in-the-loop (HIL) system. VEOS works hand in hand with other dSPACE products to provide an entire tool chain for the development and testing process. This means that tools and models that are commonly used in rapid control prototyping and hardware-in-the-loop simulation can also be used virtually. Similarly, layouts from HIL simulations can be reused in PC-based simulations with VEOS and vice versa. VEOS also provides open interfaces to connect and use existing tools. To simplify exchanging simulation models, dSPACE offers a Model Interface Package for Simulink® (MIPS) for generating Simulink implementation container (SIC) files. With the free-of-charge MIPS, modeling experts can generate the SIC file with Simulink Coder, without the need for a VEOS or ConfigurationDesk license. From the Simulink models and in combination with dSPACE Run-Time Target, they can generate code and create ZIP files that contain all the necessary code and artifacts for executing the models on different simulation platforms, such as VEOS and SCALEXIO. Model integrators that use SIC files do not have to generate code again for building the simulation, which significantly reduces the effort when using them in other projects. When you add VEOS to your rapid control prototyping or HIL tool chain to perform PC-based simulation, you can keep your existing tools. By using VEOS, you gain high flexibility and protect your investments for new projects and challenges. VEOS is part of the MathWorks Connections Program. dSPACE works closely together with MathWorks to make sure that C code generated with the Simulink® Coder™ can be integrated and simulated with VEOS. Visit the MathWorks Connections Program website to learn more. With VEOS, you can simulate Simulink and TargetLink models, FMUs, AUTOSAR software components, virtual ECUs, and ECU networks in a single environment directly on your PC. This allows for a fast integration and validation process for your ECU software at the very early development stages. You can detect errors long before the first hardware prototype exists. Another advantage of a PC-based simulation platform is that parameters, models, and results can easily be exchanged between different kinds of user groups throughout the development process. If an error is found by software architects, integrators, or testers, it can be understood, investigated, and fixed much more easily by function developers if they can use the same simulation and testing environment. By using VEOS, you can also simulate a network of virtual AUTOSAR ECUs. These include a realistic operating system and can be extended with basic software such as NVRAM or the ECU state manager, depending on the requirements of the simulation scenario. Automotive Ethernet, CAN and LIN buses and their bus-specific effects can be simulated on a PC using VEOS without any additional hardware. This gives you a precise simulation of distributed functions, including ECU network communication, very early in the development process. Compliance with FMI ensures that models created in various modeling tools can be exported as Functional Mock-up Units (FMUs) and that these FMUs can readily be integrated in VEOS-based virtual validation projects. 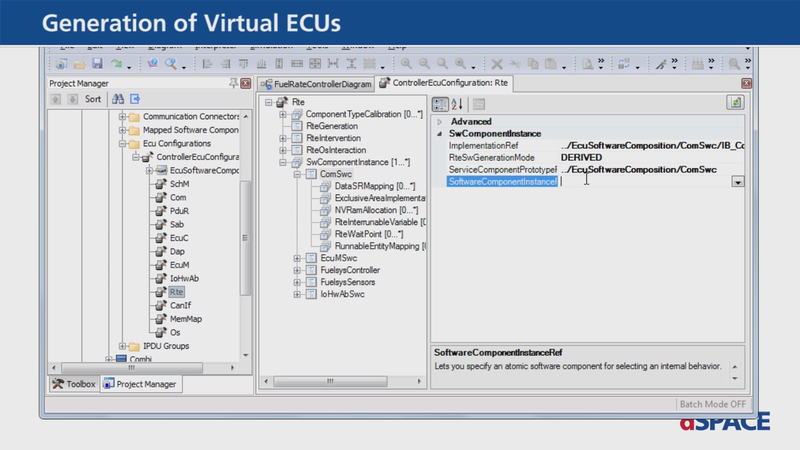 In such projects, FMUs can be integrated together with other FMUs, virtual ECUs (V-ECUs), and Simulink® models. 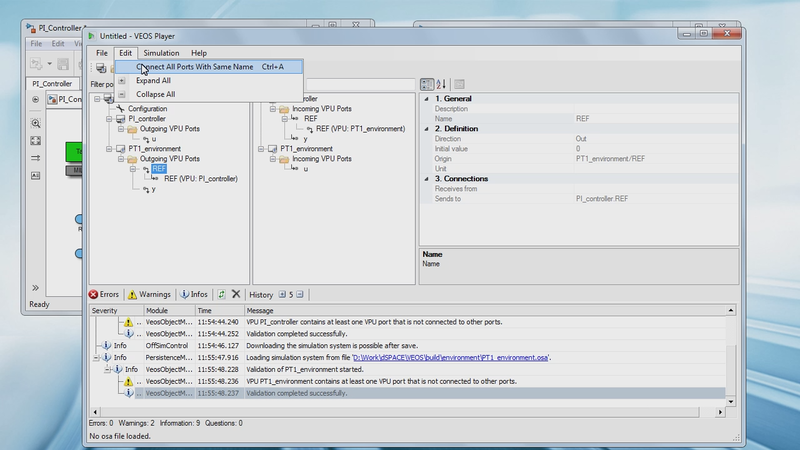 The user workflow for importing and connecting FMUs to other model interfaces is identical for all supported model types. 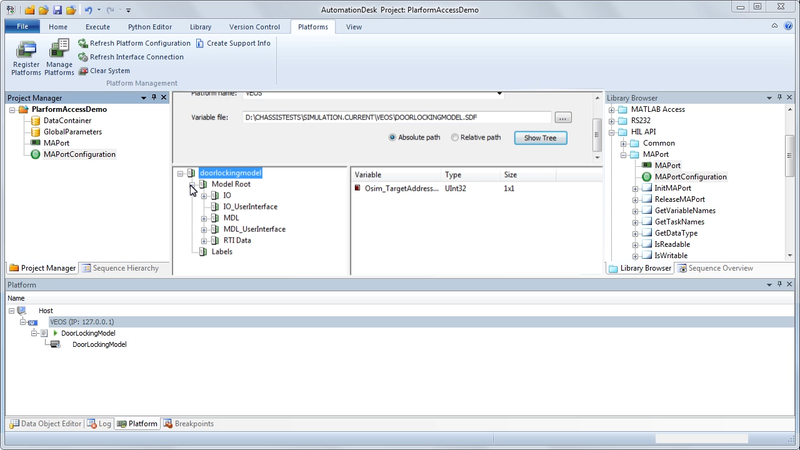 Variable and parameter access during simulation is supported by ControlDesk, AutomationDesk and XIL API. dSPACE supports the open FMI standard for an easy integration of simulation models from various sources. VEOS supports bidirectional, low-latency communication with RTMaps, the component-based software development and execution environment from Intempora. How to Simulate Adaptive AUTOSAR V-ECUs in VEOS Read the blog post on how to develop and validate an adaptive control unit combination with classic ECUs and environment models. Success Stories Overview of the wide range of application scenarios using VEOS.